I know that it's only Tuesday, but it's already been a long week. I can't believe the weekend is still days away. I guess we have to power on and hope that the rest of the days fly by! On a more positive note, I have a fun post today and I'm linking up with Tuesdays on the Run! We'll be talking about running routes, so I'm really excited to see the other posts! I'll be talking about a few different neighborhoods in the city today. These are some of the more popular areas to stay in if you're visiting the city. I thought it would be helpful to share routes as well as a fun place to refuel after your run. Enjoy! I hope you enjoy the post today, and if you're interested in seeing some routes that I previously talked about, check out this post! There are three rivers that run through Pittsburgh, with miles of running and biking trails that follow. The most popular section is from Heinz Field to PNC Park on the Northshore where you can get stunning views of the skyline. There are tons of bridges that connect the trails, which you can explore here. This little coffee shop is located in the lobby of an old building (a little confusing at first, but go in the big grey building across the street from Mellon Square). They serve amazing coffee drinks, as well as amazing smoothies and fitness shakes. The downside is that, like most places downtown that aren't Starbucks or Dunkin Donuts, it's only open Monday through Friday from 6:30-4. 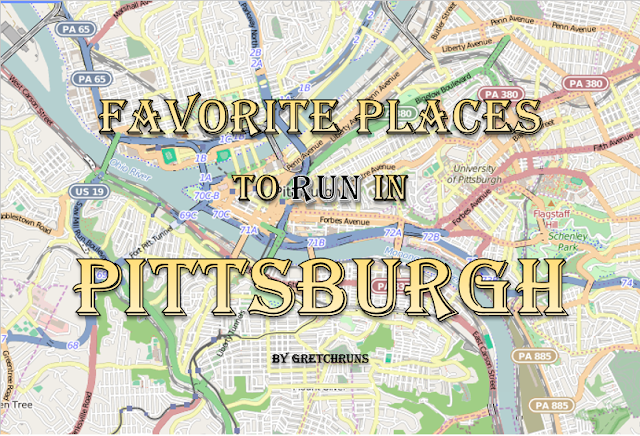 ﻿﻿Oakland is a very runner-friendly area, with Pitt's campus to run around. 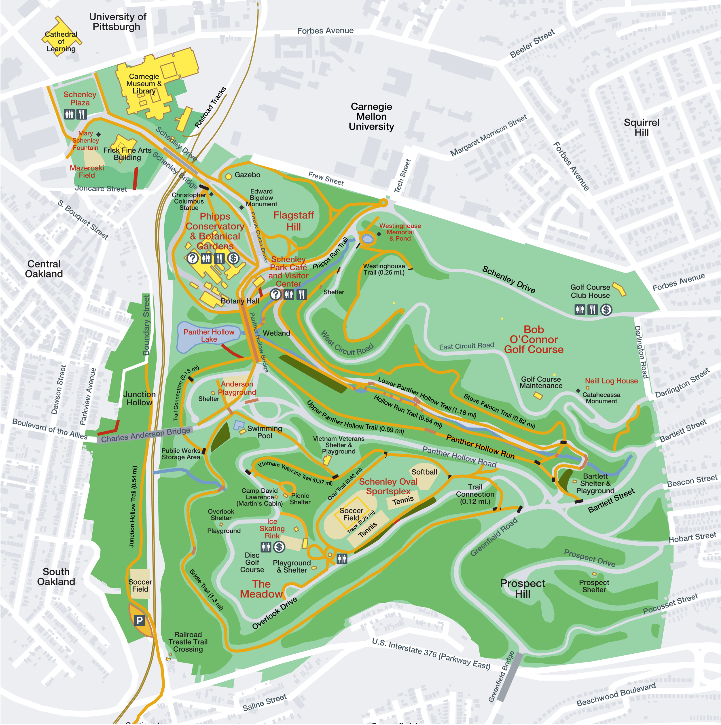 The only downside is stopping at pretty much every street, so I suggest renting a bike and riding over (or just running over) to Schenley for a better run. You'll find trails as well as a large oval with a track. I absolutely love eating dinner at the Porch, almost as much as I love the setting. It's at the beautiful Schenley Plaza, which is just steps from the Carnegie Library, Cathedral of Learning, Phipps Conservatory and tons of museums. They also offer breakfast and a brunch that sounds amazing. The views from Mt Washington are definitely the best in all of Pittsburgh. Any picture that you see of the city and the rivers are undoubtedly from the overlooks that line the main road. Grandview (appropriately named) is a great place to run and catch beautiful views of the city. There is also a major hill that goes up the mountain that is perfect for hill repeats. You can also take the incline down to Station Square and get on the river trail for a flatter course. To be honest, I haven't eaten very many times up at Mt Washington! Micro Diner has great reviews and sounds terrific- plus they offer an early bird special ($4.99 breakfast until 9AM during the week!) If you happen to be in Station Square, there are a ton of places to eat and drink there. I would recommend stopping in Crazy Mocha for the best caramel latte, or Grand Concourse for an incredible Sunday brunch. Although this isn't in the city of Pittsburgh, the northern suburbs are very popular. Tons of runners flock to North Park to run around the rolling 5 mile loop around the lake, as well as explore the miles and miles of trails. I've been running here for years and will never stop! There are also nearly-weekly races held here if you're interested in a little competition while you're visiting. This little cafe is inside of the boat house at North Park (above) with another location in the South Side. It's always completely packed and has a great breakfast menu. I also recommend checking out Go Ape if you want to test out a fun ropes course with zip lining! Do you run the same course all the time or mix it up? 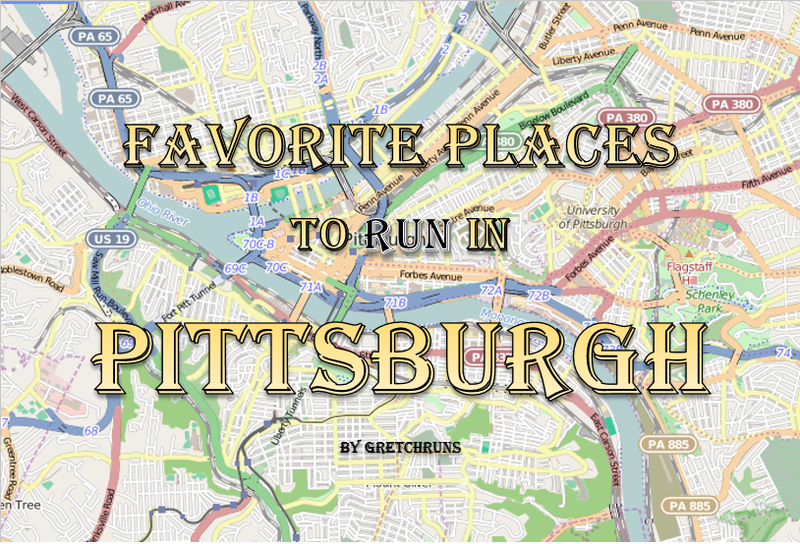 Pittsburghers- where should I go for my next run?! North Park is definitely the safest bet in the winter. The only downside is when they shut half the road for construction!! I love this post! I may have to move to Pittsburgh in the upcoming years and this is great to give me a sense of where things are. I definitely want to be in an area with nice running paths. Last time I visited I stayed in the station square area and ate at the Grand Concourse. Everything looks so pretty. We have a popular running trail in Dallas, but I haven't seen good views of the city when I've been on it. That's definitely a benefit of Pittsburgh. The views here are beautiful! 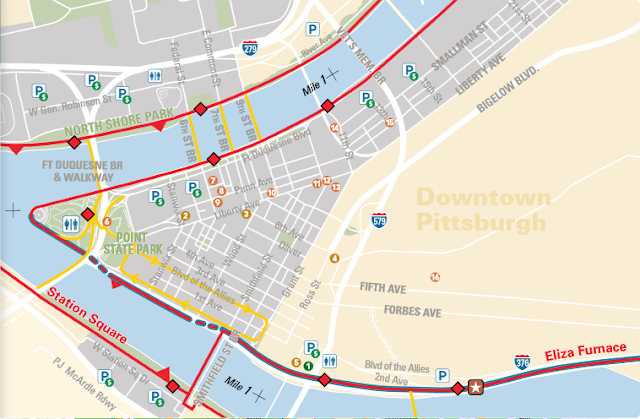 This is a GREAT guide to running in Pittsburgh - I really love the way you organized it! I've never been running in Pittsburgh but now I really want to go! I wish I saw this post last June when I was in Pitt for a wedding!!! I love to run down by the water or near the beach. Anywhere that I don't have to stop for traffic lights is idea : ) I usually run the same loop, sometimes with extensions during the week. But the first 3ish miles are always the same. Long runs I NEED to mix up and actually drive home to my parents to enjoy a more scenic run. That's something that I like to do too..otherwise I'll just head home and cut my run short. Being far away is definitely necessary :) I hope you'll come back and visit some day! I believe that the very best runs are the ones that start and end at really good food and drinks! My favourite place to run is a place called Fort Langley. It's this quaint little town with a coffee shop/bookstore that serves the most incredible chicken avocado wrap in the world. I park there and then run along the river, turn around and run back and then pig out on the patio in the sun! Thanks for sharing that Suzy- it sounds like a perfect place to visit and run. If I'm ever in BC I'll have to check that place out! Thanks Kristen! Pittsburgh is a gorgeous city and very underrated. I hope you can visit and fall in love! I've never visited Pittsburgh but it sure looks gorgeous! Thanks for sharing and linking up! I love these posts! :) When I run, I usually am on the north side river trail but lately have been venturing out further with my bike. Last night we biked from the north side to OTB on the south side for dinner and back--not a bad ride at all, but my legs are feeling it today!! I've never been to Pittsburgh. Sweet that you've mapped out some good runs! !